← Some Bolivians do not want to pay taxes! 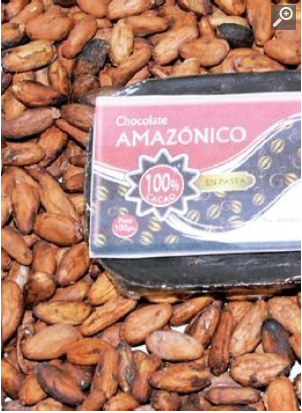 The Bolivian Amazon cocoa is among the 50 best in the world. It will be nominated today [10/28/2015] in France, where the awards called the International Cocoa Awards is organized. This important event, recognizes every two years, the work of farmers and honors excellence and diversity in the production of high quality cocoa globally, according to a press release by Helvetas Swiss Intercooperation. For this edition, 35 producing countries sent 146 samples of cocoa beans. Bolivia was one of the nations that sent five varieties to competition after an internal pre-selection. In France, a panel of international experts was responsible for the first evaluation of all products received and made a selection of the top 50 to be transformed into chocolate; including three for the Bolivian native cocoa. One of the grains classified in this select group comes from the community Carmen Emero in Ixiamas, La Paz, which since 2012, strengthens their production processes and improving the quality of cocoa, as the aroma, flavor and texture. This project is developed with support to strengthen the chain of quality cocoa in the tropical north of La Paz, which develops the institution Helvetas Swiss Intercooperation and Wildlife Conservation Society, which provides technical assistance and project support program. The organization hopes that the awards ceremony in France can achieve a place among the 10 best cocoa beans in the world. The Cocoa of Excellence (CoEx) Programme is the entry point for farmers to participate in the International Cocoa Awards (ICA), the only competition of its kind recognizing the work of cocoa farmers and celebrating the diversity of cocoa flavours globally. Every two years, this unique programme spearheaded by Bioversity International and Event International recognizes quality, flavour and diversity of cocoas according to their origin. • 146 samples of cocoa beans received and carefully processed into liquor and untempered chocolate for blind sensory evaluation by a panel of international sensory evaluation experts. • 35 participating cocoa-producing countries. • The best 50 samples selected and processed into chocolate (68.1% cocoa). Information available below on the samples (producer, genetic origin and contact details). • 26 professionals and experts carried out the chocolate sensory evaluation. • 17 International Cocoa Awards celebrated at the Ceremony held on 28th October at 19:30 at the Salon du Chocolat in Paris, France. The CoEx Programme has a stand (E2) at the Salon du Chocolat until 1 November 2015. It features chocolate samples from the best 50 samples received and available for tasting by professionals, including the 17 International Cocoa Awards. The CoEx Programme aims to promote and provide global recognition to farmers producing high-quality cocoa. It does this is through recognizing, preserving and valuing cocoa diversity and through promoting and providing global recognition of high quality cocoa. • stimulate and increases capacity of producing countries to recognize, seek out and preserve quality and diversity in cocoa. Kudos to the Asociacion de Productores de Carmen del Emero, and Angel Tapia! I welcome them to The Hall of Bolivian Fame! And personal thanks to Wildlife Conservation Society [WCS], that keeps helping Bolivia! This entry was posted in Bolivia, Business, Economics, Environment, Tourism and tagged cocoa, competitiveness, sustainable agroforestry, WCS. Bookmark the permalink.